Slender created a big splash several years ago when it offered a simple horror experience at zero cost. It put gamers in a forest and told them to collect eight randomly-placed pages while being stalked by a thin man who would end the game if he got close. Frustration over the failure to locate pages created a lack of control and audio cues reminded the player of their impending demise. It demonstrated how you only need a basic structure to create fear. 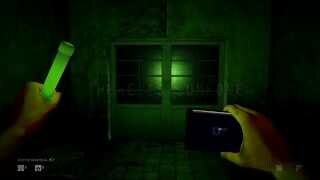 Daylight borrows heavily from Slender, attempting to scare players with frustration and trickery, with dreadful results. Daylight starts at the entrance of a hospital, putting you in the shoes of a young woman who has no idea why she is there. You receive a message on your phone from an unknown male that provides cryptic information about your role in this adventure. Luckily, your phone emits a weak light and builds a map of the maze-like levels that confront you. Your goal is to navigate the labyrinths and get through each area until you are free. Unfortunately each new area is locked behind a magical gate that requires a symbolic key. The location of each key is easily found, it’s in a glowing room you may stumble upon quite early in your search. Each key will not materialize until you have found the corresponding note that reveals its form. Of course that note will only appear when you have found enough remnants (notes) in each area. Daylight is content to give you a haystack and ask you to find all the needles before moving you to the next haystack. Glow-sticks help you find those needles, and they become the primary light source for your journey in maze-land. The green glow-sticks last only a few minutes and can be dropped or thrown, but they expire too quickly to be used as breadcrumbs. Unopened interactive objects shimmer under the light of glow-sticks, helping you clear rooms of all possible search locations. All of this searching is frivolous and the real reason behind the menial treasure hunt is to create an avenue for cheap scares. And there are plenty of cheap scares to be found. As you move through hallways you hear footsteps on the floor above, wheelchairs moving, lockers rattling and even doors closing. Some of it is passable as part of the spooky atmosphere, but most of it is mundane and occurs too often to be taken seriously. Twitch streamers are in for a horrific time as their audiences can create scares on command, putting Daylight on the cusp of the social curve and making it more fun to watch than play. Streamer or not, horror elements are less memorable when they are thrown about without adequate time to reflect. The main scares in Daylight come from ghost-like witches that appear more frequently as you collect remnants. These witches almost always spawn from behind you and produce an ear-piercing scream as you turn to gorge on their hideous faces. Witches can make you jump because it’s hard to brace for the shock of seeing a conjured ghoul placed outside your peripheral vision. These jump scares, no more advanced than the Flash-based ‘Scary Maze Game’, never earn appreciation because they lack finesse. Like Slender Man, witches do not interact with you; they simply float above the ground and flail their arms in your general direction as you slowly die from insanity. Insanity, in this case, causes the screen to be engulfed with enough strawberry jelly to make Call of Duty jealous. So unfortunately you are dead, but the good news is you can start searching the same area over again! Daylight uses your death as an opportunity to reshuffle all the cards in the deck. So while the level structure remains the same, all the notes have been moved and the interactive objects are different. This means you have to run back through all the same rooms you have been through, perpetuating the idea that you are never getting out of this nightmare. Scouring empty rooms for remnants, while you are interrupted by witches, is not an experience worth doing once let alone repeatedly. The real nightmare of Daylight is not the witches themselves; it’s the ugly thought of having to comb through areas you have already searched. Thankfully you can outrun the witches or burn them to a crisp with flares. Navigating while running may bring you face-to-face with another freshly spawned witch, but you can avoid their deathly stares by turning away. Naturally, for a game that relies on cheap tricks, the only time you cannot deploy the lifesaving flares is when you have the key in your hand. Getting to the locked door is easy if you can follow the basic map on your phone. As long as you never turn back, you should live long enough to begin another nauseating search in the next labyrinth. Unfortunately the environments you run through are undistinguished mazes. The primary reason for this is that they are randomized for each play-through. Aside from the unchanging levels that bridge areas together, the corridors are stitched together like something from Diablo. Technically this works, except when a possessed drawer blocks the corridor you need to enter, but you can see all the pieces that make up the hallways and rooms. It does not feel natural to enter three identical rooms within the span of a few minutes, and it makes the searching even more depressing. Random level design seems like a clever idea for a horror game, but it translates into jumbled levels with no soul and choppy flow. The environments are also devoid of character. First there are the hospital corridors, then prison cells, then sewers and finally a forest which clearly indicates the game’s intention to be the spiritual successor to Slender. Ironically, the forest area is the least scary because it gives you unlimited flares to use against witches that reappear every 15 seconds. The indoor zones are claustrophobic with little to differentiate one corridor from the next. You walk for minutes and feel like you have not made any progress. Then you push a contextual crate ten inches and climb to the next set of hallways. All of the hallways are rendered in Unreal Engine 4, which makes Daylight the first game to use the new engine from Epic. Visually, its first mistake is using a chromatic aberration filter, which is a neat camera blur technique that hurts my eyes. Without chromatic aberration the game is bland with a monotone atmosphere. The muted real-time shadows, cast from multiple light sources, are not worth the abysmal framerate when other games manage more detail with better performance. If Daylight is an indication of what to expect from Unreal Engine 4 then we have good reason to be afraid. Daylight is bad enough to make you rethink your desire to play horror games. It follows the cheap formula of Slender, which is somewhat understandable given the furore that title created years ago. 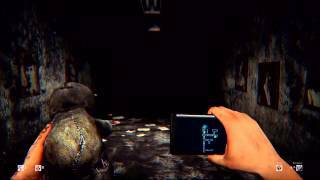 However, its minimal attempt to change the rules set down by Slender make it unnecessary in a world of better horror games such as Outlast or Amnesia. The tedious adventure of searching for notes in a randomized, empty world is never engaging. Daylight may produce copious amounts of jump scares, but it is far from a successful horror experience. Randomized levels produce bland environments and repetitive corridors. At least the music is creepy and lighting satisfactory. Finding needles in a maze of haystacks is not appealing. Infinite flares make the last area comedic. Cheap witch spawns produce annoying jump scares. The numerous story notes are not interesting and there is no character to the environments. Game length can be as short as 30 minutes and still repetitive. Poor frame rates in some areas. Alt-tab forces strange resolutions. Game crashes in the last level if you die. Many interactive objects will not open if you are too close. If you like Slender, play that instead and pretend you are navigating a maze of corridors. If you hate Slender, run far away from Daylight as though evil witches are chasing you. "The wrong recipe for horror"
Daylight is ranked #1411 out of 1434 total reviewed games. It is ranked #149 out of 152 games reviewed in 2014.